Two-time MVP Mike Trout is back in the Los Angeles Angels’ lineup on Monday after missing nearly a week with a groin injury. Trout returns to his regular spot hitting second in the lineup, although the team is easing him back into action at designated hitter. 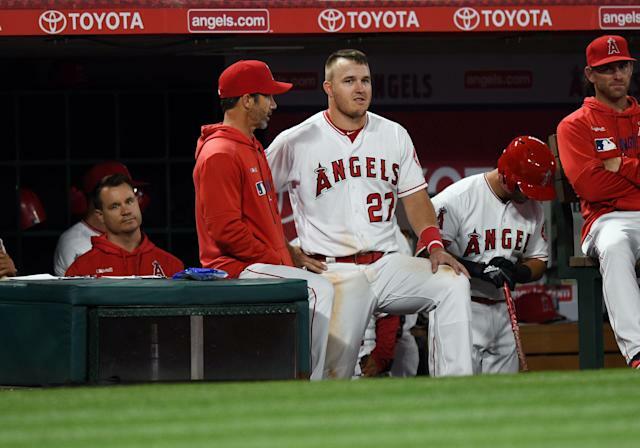 Trout initially suffered the injury in last Tuesday’s game against the Milwaukee Brewers when he was running to second on an Andrelton Simmons ground ball. Although he stayed in the game an extra inning, manager Brad Ausmus took him out as a precaution. The Angels opted not to bring Trout to their road series against the Chicago Cubs, but he has rejoined the team for a three-game set visiting the Texas Rangers. The decision not to place him on the 10-day injured list paid off because he only had to miss three games due to a day off and rainout. Prior to the injury, Trout was off to a blistering start with a .406/.592/.938 batting line to go with five home runs in 49 plate appearances. He led baseball in on-base percentage last season and slashed .346/.438/.640, while finishing second in the MVP race to Mookie Betts. Trout just signed a record 12-year, $430 million extension with the Angels in March that will likely keep him in Anaheim for the rest of his career.